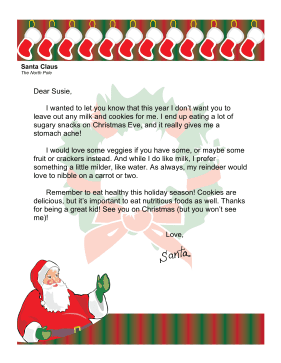 For households that promote healthy lifestyles, this letter from Santa requests vegetables over milk and cookies. I wanted to let you know that this year I don't want you to leave out any milk and cookies for me. I end up eating a lot of sugary snacks on Christmas Eve, and it really gives me a stomach ache! I would love some veggies if you have some, or maybe some fruit or crackers instead. And while I do like milk, I prefer something a little milder, like water. As always, my reindeer would love to nibble on a carrot or two. Remember to eat healthy this holiday season! Cookies are delicious, but it's important to eat nutritious foods as well. Thanks for being a great kid! See you on Christmas (but you won't see me)!